Venezuela’s embattled President Nicolás Maduro has called Donald Trump’s government a “gang of extremists” and blamed the US for his country’s crisis. Relations between the US and Venezuela were already fraught before President Trump’s administration became one of the first to back Mr Guaidó as interim leader. Venezuela broke off diplomatic relations in response while Mr Trump said the use of military force remained “an option”. In a rare interview, Mr Maduro said he hoped “this extremist group in the White House is defeated by powerful world-wide public opinion”. The US, which accuses Mr Maduro’s government of human rights violations and corruption, has led the international pressure on the Venezuelan president to step down. It has imposed a raft of economic measures on the country, including against the state-owned oil company, PDVSA, aiming to hit Venezuela’s main source of revenue. In recent years the US has frozen Mr Maduro’s US assets, restricted Venezuela’s access to US markets and blocked dealings with those involved in the country’s gold trade. It has also criticised Mr Maduro’s increased use of the courts and security forces to suppress political opposition. Secretary of State Mike Pompeo has called the government a “disastrous dictatorship” while National Security Advisor John Bolton said Mr Maduro was holding an “illegitimate claim to power”. The president has rejected allowing foreign humanitarian aid into the country, a move that is being organised by the opposition. He said Venezuela had “the capacity to satisfy all the needs of its people” and did not have to “beg from anyone”. Three million people, or 10% of the population, have left the country since the economy started to worsen in 2014, according to the UN. And Mr Guaidó says more than 300,000 Venezuelans are at “risk of dying”. Mr Maduro, who has blamed US sanctions for Venezuela’s economic woes, said the US intended to “create a humanitarian crisis in order to justify a military intervention”. Mr Maduro, in power since 2013, was re-elected to a second term last year but the elections were controversial with many opposition candidates barred from running or jailed, and claims of vote-rigging. 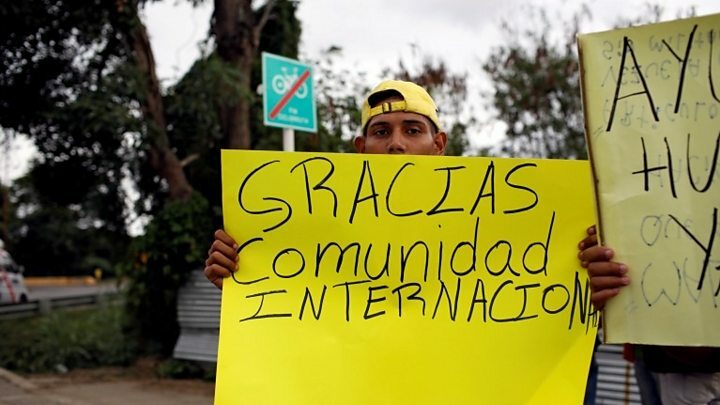 He also said only “about 10” governments supported Mr Guaidó – in fact, more than 30 have announced their support for the opposition leader – and that they were trying to “impose a government that nobody has elected”.